Submitted by Adrian Brown on Wednesday, May 16, 2018 - 22:14. B-DOS is an improved SamDOS . B-DOS was originally written to use with a harddisk (using the ATOM internal hard disk interface) but has been extended to support the ATOM-Lite and the Trinity Ethernet Interface . B-DOS can also be used without a hard disk but it only works with one disk drive. Date stamping (Both Dallas clock and SAMBUS clock). BDOS works with ATOM IDE harddisk interface and supports harddisks up to 8 Gb. To make using a hard disk as user friendly as possible, the harddisk works like a virtual second disk drive. The storage capacity of a harddisk is devided into 800K blocks. Such a 800K block is called a record and has the same format as a floppy disk. (10 sectors per track, 80 tracks and 2 sides). Thanks to the coding skills of Chris Pile , B-DOS for the Trinity Ethernet Interface now supports MMC/SD/SDHC cards up to 64GB in size! The new B-DOS will be bundled with the Trinity Ethernet Interface from today and it will also feature on one of the coverdisks with SAM Revival 25.
compatible with both SAMDOS and Masterdos. 128 &80       INIT    Same as HAUTO. 129 &81       HGTHD   Get file header. 130 &82       HLOAD   Load data from from file which is selected with HGTHD. 131 &83       HVERY   Verify data from from file which is selected with HGTHD. 132 &84       HSAVE   Save file. 134 &86   B   HVMSAD  Verify multiple sectors. 136 &88       HAUTO   Loads "AUTO*" file. 139 &8B       HVAR    Expects the DVAR number on the calculator stack. 147 &93       HOFLE   Open a new file. 148 &94       HSBYT   Save Byte in the A register to the file opened with HOFLE. 149 &95       HWSAD   Write a single sector. 150 &96       HSVBK   Save a Block to file opened with HOFLE. 152 &98       HCFSM   Close file sector map. 156 &9C   B   HRECORD Select a record. 157 &9D   B   HVEBK   Verifies a block. 158 &9E       HGFLE   Get file. 159 &9F   B   HLBYT   Load byte from file. 161 &A1       HLDBK   Load a block from file. 165 &A5       HDIR    Clears the screen and outputs a directory to screen. 166 &A6       HERAZ   Erase file. pointer used internally by SAMDOS. header (file name at IX+1 to IX+14). file name may include "D1:" or "D2:"
130 &82       HLOAD  Load data from from file which is selected with HGTHD. BFFFH, while the destination page must be paged in using the HMPR register. 131 &83       HVERY  Verify data from from file which is selected with HGTHD. re-inits clock,hard disk and DVARS. 136 &88       HAUTO  Loads "AUTO*" file. This file can be BASIC or CODE type. 139 &8B       HVAR   Expects the DVAR number on the calculator stack. Restacks the basic address of the required DVAR. calculator stack. On entry, the FPCS should hold the desired DVAR number. [ MasterDOS: HSDIR 145 (&91) Select Directory. Similar to DIR="name" in Basic. with 0 to overite existing file. 148 &94       HSBYT  Save Byte in the A register to the file opened with HOFLE. 149 &95       HWSAD  Write a single sector. 150 &96       HSVBK  Save a Block to file opened with HOFLE. selected in location C starting at HL. Hl points also to location C in memory. in location B (&4000 to &7FFF). number of items. The A register specifies the number of characters to sort on. record number HL. Else select record by. name. HL points to the 16 char. name. 157 &9D   B   HVEBK  Verifies a block. See HSVBK for more details. 158 &9E       HGFLE  Get file. [ SAMDOS: Get a file from the disk. The IX register must point to the UIFA. 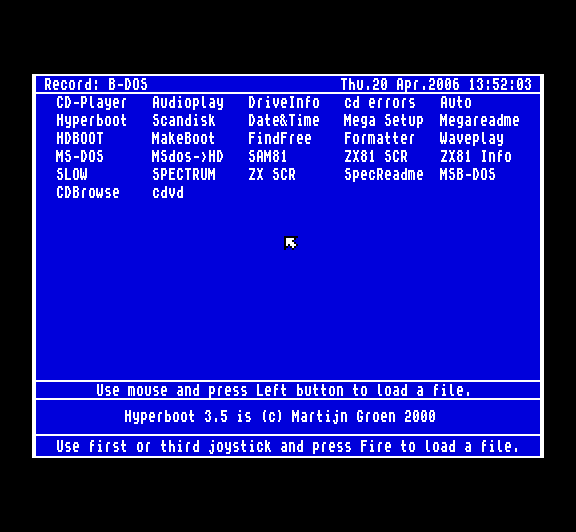 [ MasterDOS: Get a file from the disk. The IX register must point to the UIFA. 159 &9F   B   HLBYT  Load byte in D register from file. [ SAMDOS: HRSAD D contains the track number and E contains the sector number. 161 &A1       HLDBK  Load a block from file. See HSVBK for more details. 165 &A5       HDIR   Clears the screen and outputs a directory to screen. the file to be erased. Edwin developed B-DOS up to V1.5a then Martijn Groen took over the development. Colin Piggot then took up development for SD card support on the Trinity Ethernet Interface . B-DOS V1.5t is a modified version of V1.5a to support MMC and SD cards, further enhancements were made to increase the size of handled cards by Chris Pile .